The human body has several closed loop and feedback control systems that enable it to maintain homeostasis for various health-related elements, i.e. body temperature, blood pressure, blood glucose, blood pH. Homeostasis is the ability of the human body (or a cell) to maintain a constant internal environment of stability and balance in response to environmental changes. Homeostasis is an important characteristic of living things and a unifying principle of biology. Keeping a stable internal environment requires constant adjustments as conditions change inside and outside the cell. The adjusting of systems within a cell is called homeostatic regulation. Because the internal and external environments of a cell are constantly changing, adjustments must be made continuously to stay at or near the set point (the normal level or range). Homeostasis can be thought of as a dynamic equilibrium rather than a constant, unchanging state. The nervous and endocrine systems control homeostasis in the body through feedback mechanisms involving various organs and organ systems. Examples of homeostatic processes in the body include body temperature control, blood pH balance, blood glucose regulation, water and electrolyte balance, blood pressure, and respiration. The endocrine system plays an important role in homeostasis because it uses hormones to regulate the blood and the activity of body cells to stay within a tight range. The release of hormones into the blood is controlled by a stimulus. The stimulus either causes an increase or a decrease in the amount of hormone secreted. Then, the response to a stimulus changes the internal conditions and may itself become a new stimulus. This self-adjusting mechanism is called feedback regulation. The specific system we're talking about here is the Blood Glucose Regulation System. The hormones are insulin and glucagon. The stimulus is raised or lowered blood glucose. The primary goal of the body’s Blood Glucose Regulation System is to keep blood glucose in a tight range between 70 and 110 mg/dL (or 3.89 to 6.11 mmol/L). 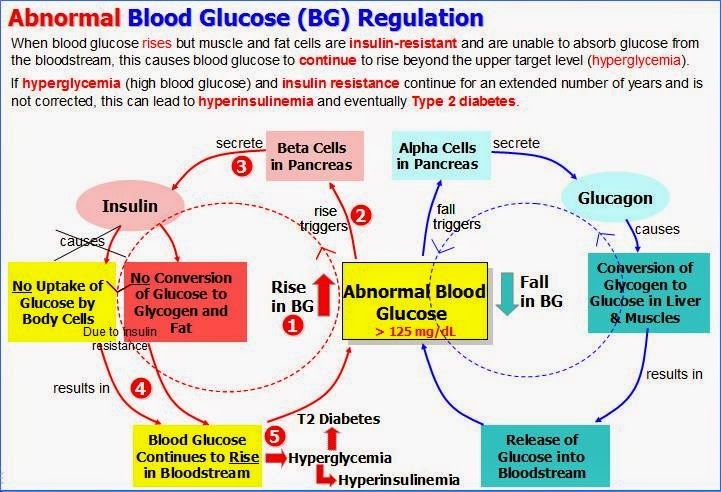 As depicted in the following diagram, when blood glucose rises (for example, after eating), the hormone insulin is secreted from the beta cells of the pancreas, triggering muscle and fat cells to absorb glucose from the bloodstream causing blood glucose to decrease. 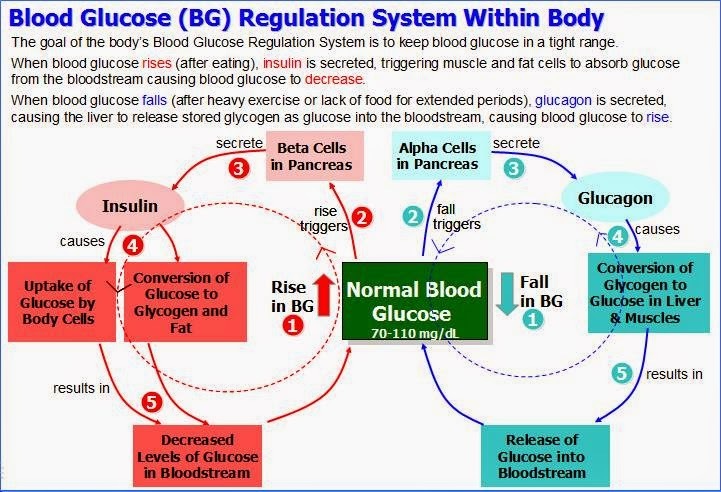 When blood glucose falls (after heavy exercise or lack of food for extended periods), glucagon is secreted from the alpha cells of the pancreas, causing the liver to release stored glycogen as glucose into the bloodstream, causing blood glucose to rise. However, in a diabetic's body, when blood glucose rises, the muscle and fat cells are unable to absorb glucose from the bloodstream (because they are insulin-resistant). This causes blood glucose to continue to rise beyond the upper target level (this is called hyperglycemia). As depicted in the following diagram, the Blood Glucose Regulation System isn't working as designed. To try to correct the high glucose problem, the pancreas continues excreting more and more insulin to try to "push" the excess glucose into the cells. If the problem is not corrected, this can lead to hyperinsulinemia. And, if insulin resistance, hyperglycemia and hyperinsulinemia continue for an extended number of years, this can lead to Type 2 diabetes. Note: This topic is discussed in more detail (at the cellular level) in the DTD Science of Diabetes ebook. We have all experienced cuts and bruises growing up and, if you have children, then, you've dealt with this recently: a scraped knee, a paper cut, a leg bruise, a finger cut, a sore, a hand burn, etc. We don't really give this a second thought because our bodies and our children's bodies do such a good job at healing and repairing the damage to our skin. However, if the cut got infected, then, you may have had to get an antibiotic or see a doctor. But, still, it wasn't much of a problem to concerned about compared to other more serious health problems. Have you ever wondered when you got a cut how your body healed the cut? This may not seem like an important topic, but, actually wound healing is becoming a major problem in the United States and around the world. Why is that? How can such a minor problem become such a major health concern? 1. The general population is getting older. 2. The number of people with diseases like diabetes is increasing. 3. People ignore the wound, not realizing that it's not healing. 4. 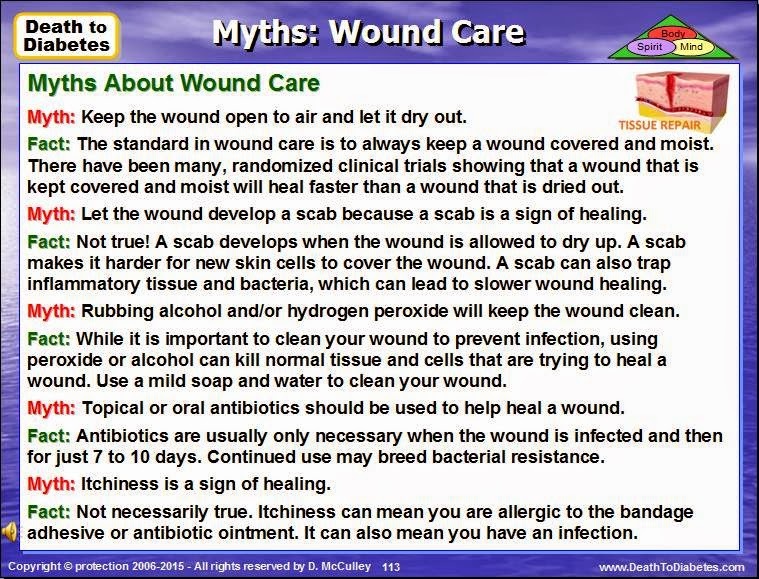 There are myths and a lack of education by the public and the medical profession about proper wound care. Despite the advancements in wound care, there are many common myths and attitudes people believe about healing wounds. Some of these ideas even come from doctors who refer patients to wound centers. However, using these methods can slow or even stop the healing process. Myth: Keep the wound open to air and let it dry out or at least let the air get to it at night. Fact: The standard in wound care is to always keep a wound covered and moist. The idea of “moist” wound healing has been around since the 1960s and there have been many, many, randomized clinical trials showing that all else being equal, a wound that is kept covered and moist will heal faster than a wound that is dried out. It may go against common household lore, but clinical studies prove keeping your wound clean, moist and covered helps it heal faster. Many doctors and pharmacists recommend using an over-the-counter antibiotic ointment to moisten the wound. Recent research suggests using a wound dressing with polysaccharides (i.e. from a polysaccharide paste, raw honey, aloe vera). Myth: Let the wound develop a scab because a scab is a sign of healing. Fact: Not true! A scab develops when the wound is allowed to dry up. A scab makes it harder for new skin cells to cover the wound. A scab can also trap inflammatory tissue and bacteria, which can lead to slower wound healing and a greater chance of infection. Actually, the goal in caring for a wound is to prevent scab formation, say modern doctors. That's because a scab -- or hardened fluid and debris encrusting your wound -- will interfere with the healing process and could eventually lead to scarring. A broken scab can also lead to infection. To avoid scabbing, keep your wound moist with an appropriate cream, ointment or polysaccharide blend. Note: To get rid of a scab, don't pick at it or try to pull it off! Instead, place a wet gauze or a cloth compress on the wound for five minutes every few hours. Do not tug or rub the skin, since doing so could harm the healing tissue and cause scarring. Myth: Rubbing alcohol and/or hydrogen peroxide will keep the wound clean. Fact: While it is important to clean your wound as soon as possible in order to prevent infection, using peroxide or alcohol is a bad idea, say most medical experts. Rubbing alcohol hasn’t been shown to be any better than using plain tap water to clean out a wound. Hydrogen peroxide is no better. Some studies show that hydrogen peroxide and rubbing alcohol can kill normal tissue and cells that are trying to heal a wound. The bottom line is that the repeated use of rubbing alcohol and hydrogen peroxide can be harmful to the wound-healing process. Instead, clean your wound right away under running tap water or under a running shower. Use a mild liquid soap if you have it. You can also use a pressurized bottle of sterile saline -- available at most pharmacies -- to clean your wound if you don't have access to a shower or clean tap water. If your flesh is embedded with debris, see a doctor immediately. You may be given a tetanus shot. This helps prevent the bacteria found in dirt and soil from making you sick. It's essential to get the dirt and debris out of a scrape so it won't leave behind a permanent "tattoo" on your skin. Your doctor or nurse may freeze the area before cleaning it, if you are in extreme pain. Myth: Topical or oral antibiotics should be used to help heal a wound. Fact: There are times when antibiotics are necessary to help heal a wound, but only when the wound is infected and then for just seven to 10 days. Continued use may only breed bacterial resistance. See your primary care provider if you think your wound is infected. Myth: Itchiness is a sign of healing. Fact: Not necessarily true. Itchiness can mean you are allergic to the bandage, bandage adhesive or antibiotic ointment. It can also mean you have an infection. Be aware with what's going on your skin and see a doctor if you think your wound is in trouble. Myth: Put a bandage or gauze dressing on the wound and forget about it. Fact: The purpose of wearing a bandage/dressing is to keep the wound clean and to absorb the fluid that oozes from it. Leaving a bandage on for too long can lead to infection and prevents you from monitoring your injury properly. Be on the lookout for signs of infection, such as bad odors emanating from the wound, red streaks and fluid that's yellow or green. Such symptoms require immediate care from a doctor. Extreme pain is not unusual with a wound in the first several days, but if the pain gets worse or spreads, contact your doctor immediately. Note: If you're diabetic and a wound is not healing, take photos of the wound daily and send them to your doctor. FYI: The next blog post will discuss how to treat wounds and cuts properly. There are several long-term microvascular and macrovascular complications that develop if your diabetes is not managed properly and your blood glucose is not maintained within the normal range. Kidney damage (nephropathy). The kidneys contain millions of tiny blood vessel clusters that filter waste from your blood. Diabetes can damage this delicate filtering system (leading to proteinuria). Severe damage can lead to kidney failure or irreversible end-stage kidney disease, which often eventually requires dialysis or a kidney transplant. Nerve damage (neuropathy). Excess sugar can injure the walls of the tiny blood vessels (capillaries) that nourish your nerves, especially in the legs. This can cause tingling, numbness, burning or pain that usually begins at the tips of the toes or fingers and gradually spreads upward. Poorly controlled blood sugar can eventually cause you to lose all sense of feeling in the affected limbs. Further nerve damage in the feet or poor blood flow to the feet increases the risk of various foot complications. Left untreated, cuts and blisters can become serious infections, which may heal poorly. Severe damage might require toe, foot or leg amputation. Cardiovascular disease. Diabetes dramatically increases the risk of various cardiovascular problems, including coronary artery disease (with/without angina), congestive heart failure, heart attack, stroke, narrowing of arteries (atherosclerosis) and high blood pressure. Alzheimer's disease. Type 2 diabetes may increase the risk of Alzheimer's disease. The poorer your blood sugar control, the greater the risk appears to be. Other problems. Damage to the nerves that control digestion can cause problems with nausea, vomiting, diarrhea or constipation. 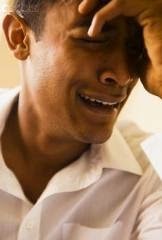 For men, erectile dysfunction may be an issue. The following flowchart depicts how these complications develop in a diabetic's body. 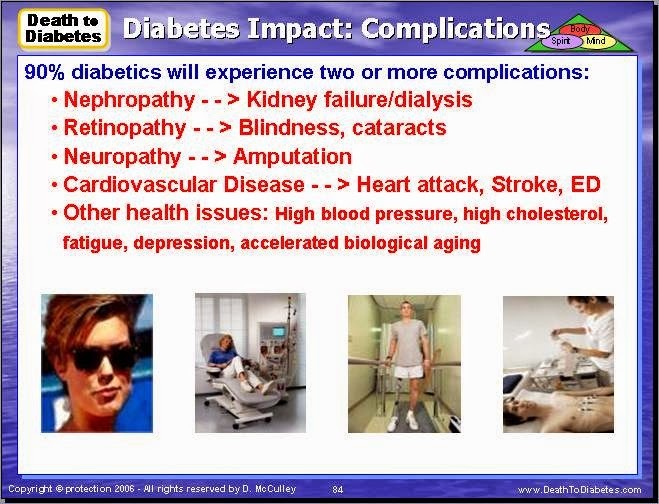 The following diagram depicts how these complications develop in a diabetic's body at the cellular level. In addition to the aforementioned diabetic complications and health problems, there are other health complications that can occur before or after you become diabetic including the following: high blood pressure; high inflammation (high homocysteine, C-reactive protein, cholesterol, fibrinogen); fatigue; sexual dysfunction; and, frequent infections (especially gum disease). Note: For more details about diabetes and its complications (and how to treat them naturally without drugs), refer to Chapters 3 and 15 of the Death to Diabetes book or Chapters 2-6 of the DTD Science of Diabetes ebook. 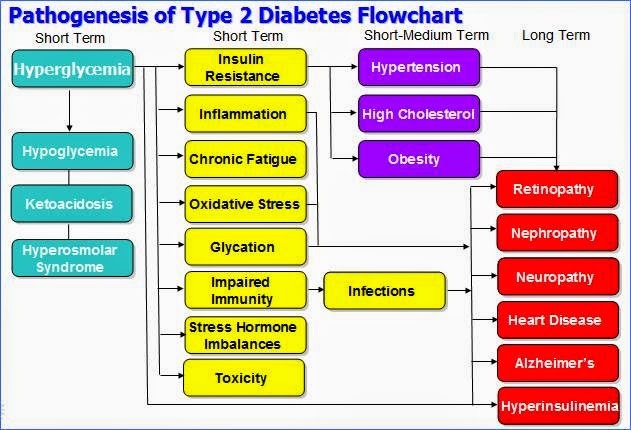 Type 2 diabetes is seen primarily as a "blood sugar" problem. As a result, most people with diabetes don't really take this disease seriously -- until they start to have problems with their kidneys, eyes or feet. But, by then, the disease has had a chance to take hold in your body, making it difficult to manage the disease and slow down its progress towards amputation, kidney failure, blindness, heart attack or stroke. 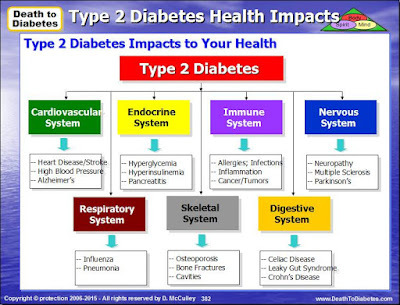 As depicted in the diagram below, Type 2 diabetes affects every system in the human body, including two systems that are not included in the diagram (I ran out of room :-)): the Integumentary System and the Reproductive System. 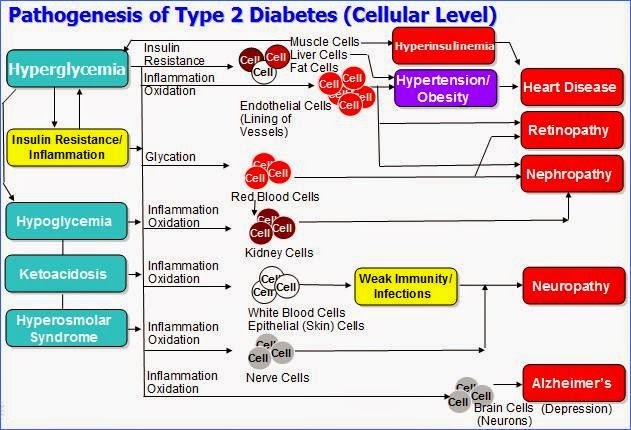 Let's take a look at Type 2 diabetes at the cellular level. Type 2 diabetes is a combination of insulin resistance and inflammation that affects the muscle cells, liver cells and fat cells. Insulin resistance and inflammation prevent these cells from effectively using the insulin produced by the pancreas. That is, the insulin receptors on the surface of each cell are damaged (inflamed), ignoring the presence of insulin in your blood and refusing to allow glucose from your blood to enter your cells. In addition to the muscle, liver and fat cells, diabetes affects many other cells in the body. As a result, diabetes affects almost every major part of the human body, which can lead to problems with the eyes, kidneys, feet, heart, brain and other organs. Blood vessel cells: of the circulatory system's arteries and veins begin to degenerate and weaken, causing leakages and sometimes clotting; and, reduces the amount of oxygen getting to all parts of the body. Leakages in the small blood vessels that feed the eyes, kidneys, feet, etc. along with thickening of capillary walls can lead to diseases associated with those parts of the body. And, the damage to the large blood vessels causes hardening of the arteries (atherosclerosis), which can lead to a heart attack, stroke or poor circulation in the feet. In addition, these effects reduce blood circulation to the skin, arms, legs, and feet; and, also, change the circulation to the eyes and kidneys. Reduced capillary blood flow may cause some brown patches on the legs. Brain cells (Neurons): causes synaptic degeneration (synapses are the structures at the end of each neuron used to communicate between neurons); also, affects the hippocampus portion of the brain causing a reduction in neurocognitive speed, learning and mental functioning and focusing, leading to a slowdown in memory processing, brain fog, memory loss, a lack of concentration; and, depression. Also, the formation of amyloid plaques between nerve cells (neurons) in the brain can lead to Alzheimer's Disease (AD). Glucose triggers the brain to release natural chemicals called opioids, which give the body a feeling of intense pleasure. The brain then recognizes this feeling and begins to crave more of it. Similar to a cocaine addiction, when you crave glucose, it activates certain areas in the brain, specifically, the hippocampus, the insula and the caudate) that are activated. Endothelial cells: in the lining of all blood vessels and the inner walls of the heart chamber; can lead to high blood pressure, heart attacks, strokes, etc. Eye cells: Because of damage to the small blood vessels that nourish tissue and nerve cells in the retina, blood clots and scar tissue can form in front of the retina, preventing light from hitting the retina, resulting in blindness. Fat cells: become insulin-resistant, along with muscle and liver cells, can cause obesity. Heart (muscle/chamber) cells: can lead to heart disease, heart attacks. Kidney cells (incl. Nephrons (Glomerular cells, Renal corpuscle (parietal cells, podocytes and mesangial cells) and the various tubules (columnar and cuboidal epithelial cells): lose the ability to filter the blood as the blood vessels in the nephrons become more porous. Over time amino acids and proteins escape into the urine through these pores, which is an indication of kidney dysfunction eventually leading to kidney failure and dialysis. Liver cells: can lead to a increased toxins, increased cholesterol, fatty liver, many health issues. Nerve cells: damage to the blood vessels in the legs and damage to the myelin sheath of nerve cells in the legs leads to numbness, pain, and eventually amputation. Pancreatic beta cells: may wear out and lose their ability to produce insulin. Red blood cells: become hardened and stickier, making the blood thicker and slow-moving; and more prone to clotting. Can lead to high blood pressure, eye disease, kidney disease, heart disease, amputation, inflammation, infection; and many other health problems/diseases, because the circulatory system touches every major system in the body. Skin cells: (or epithelial cells) can cause dry skin, slow-healing bruises and infections, damaged skin due to glycated collagen. White blood cells: can weaken the immune system, leading to infections, slow-healing wounds and other diseases. Please Note: This is, by no means, a complete list of every cell and organ in the human body. But, this list should help you to better understand how diabetes can affect so many parts of the body. Note: The circulatory system and the nervous system go to every major part of the human body. 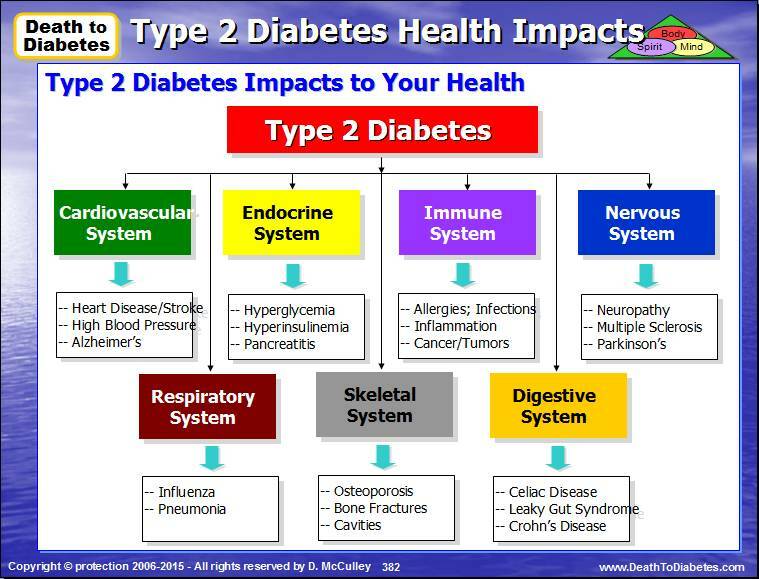 And, since diabetes affects these two systems, then, you can see why diabetes affects every major part of the human body. It is a known fact that (unmanaged) stress can cause your blood glucose to rise, which, over time, can gradually destroy your body and your health. The good news is that you can control your blood glucose and limit the damage to your body caused by living a stressful life. How? 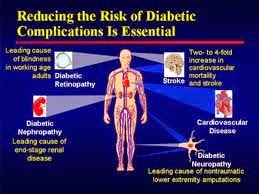 By simply embracing a superior nutritional program such as the Death to Diabetes Nutritional Program. Although this program was designed to address your diabetes, it also reduces the impact of stress on your body and your overall health. 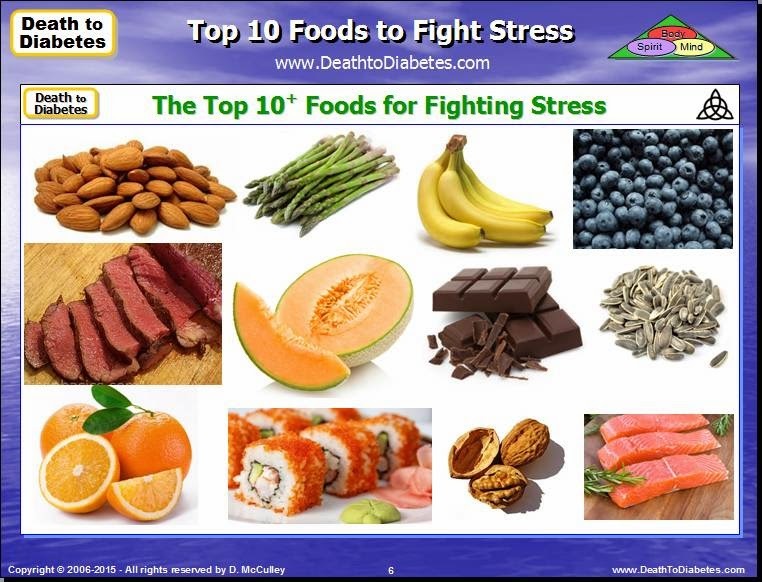 Some "anti-stress" foods that you can add to your daily diet to combat stress and relieve the effects of stress on your health include: almonds, asparagus, avocado, bison, blueberries, cantaloupe, cottage cheese, oranges, wild salmon, spinach, sunflower seeds, sushi and walnuts. Almonds. Thanks to being high vitamin E, vitamin B2 and magnesium, almonds can help bolster your immune system when you're stressed, reported Women's Health. Just a quarter cup of almonds each day does the trick. A report published in the American Journal of Clinical Nutrition found that adults who incorporated nuts into their diets helped them with their stress. A review of 31 studies about eating nuts found that people who added nuts to their diets and who replaced other foods with nuts lost more weight (an average 1.4 pounds more) and reduced their waist sizes by more than half an inch. The nutrients in several types of nuts can help protect your body against the damaging physical effects of being stressed out. So, have a little snack and eat a handful of almonds instead of eating a granola bar. Tip 1: For variety, spread some almond butter on fruit slices or whole grain crackers. Tip 2: Avoid roasted or salted almonds -- instead eat raw, organic almonds. Asparagus. This amazing green vegetable is an excellent anti stress food, a natural source of folic acid, which is an important chemical that helps to balance your mood and block the hormones produced when we are stressed out. Tip: Sauté some asparagus tips for a tasty omelet. Go with steamed or grilled spears as a side vegetable for meat, fish or poultry. Snack on some steamed spears by dipping in some dressing. Avocado. We need B vitamins for healthy nerves and brain cells, and feelings of anxiety may be rooted in a B vitamin deficiency. Avocados are rich in stress-relieving B vitamins. Bonus: They're also high in monounsaturated fat and potassium, which help lower blood pressure. Tip: Next time stress has you reaching for a pint of full-fat ice cream, opt for a non-dairy DIY version made with avocado blended with a ripe banana, vanilla extract, nut milk, and stevia. Freeze, then chill-out. Bananas. This fruit is rich in vitamin B, an important nutrient to keep stress hormones and blood pressure levels under control even in the most stressful situations. Please Note: Avoid bananas if you're diabetic unless you have stabilized your blood glucose levels for at least 3 months following our Death to Diabetes program. Tip: Don't eat the banana by itself. Instead, eat the banana with a handful of nuts to offset the potential blood sugar spike caused by the banana. Bison. Rich in iron, vitamin B, selenium, niacin, and zinc, bison (and free-range beef) can be part of an excellent meal after a stressful day. Bison is loaded with Vitamin B12, a co-factor of energy production). Note: The healthy gut bacteria in your body does not manufacture enough Vitamin B12 to meet your overall needs, but Vitamin B12 is abundant in bison meat. Blueberries. This great low calorie product is rich in antioxidants, fiber and vitamin C, all of which effectively help us fight against stresses. When we’re stressed, our bodies need vitamin C and antioxidants to help repair and protect cells. James Joseph, PhD, lead scientist in the Laboratory of Neuroscience at the USDA Human Nutrition Research Center on Aging at Tufts University calls blueberries the "brain berry". Dr. Joseph’s claim was made with the publication of his landmark blueberry research. This has since been bolstered by animal studies demonstrating that daily consumption of modest amounts of blueberries dramatically slows impairments in memory and motor coordination that normally accompany aging. Moreover, a wealth of exciting new research clearly establishes that in addition to promoting brain health, this long-prized native North American fruit—whether consumed fresh, frozen, canned, or as an extract—may help with reducing the negative effects of stress on our health along with a range of other diverse health benefits. Tip: Blueberries may seem small, but just a handful pack a powerful punch of antioxidants and vitamin C, making them mighty stress-busters. While blueberries are tasty all by themselves, freeze them for a cold berry snack, or add them to a serving of yogurt or high-fiber cereal. Cottage cheese. This type of cheese is very rich in proteins, calcium, as well as vitamins B2 and B12, which assist in banishing such symptoms of stresses as anxiety and restlessness. Since cottage cheese is a good source of vitamins B2 and B12, mixing it with cantaloupe for breakfast or a midday snack will help you banish your feelings of anxiety. Dark chocolate. It is known as one of the best anti-stress foods which is packed with flavonoids with amazing relaxing properties. Phenethylamine is another very important natural substance which can be found in dark chocolate. This chemical enhances our mood and makes us feel relaxed too. In addition to this, studies have shown that regular consumption of dark chocolate in small doses is linked to lower levels of cortisol, known also as the stress hormone. High in flavonoids, which are lauded for their relaxing properties (lemon balm and chamomile tea are other excellent sources), dark chocolate also contains phenethylamine, a chemical that enhances your mood. The darker the chocolate, the more healthful substances you’re being paid in your diet, so look for bars that are at least 70 percent cacao. Researchers found that eating the equivalent of one mean-sized dark chocolate candy bar (1.4 ounces) each day for two weeks reduced levels of the stress hormone cortisol as well as the “fight-or-flight” hormones known as catecholamines in highly stressed people. Oranges. Oranges have high vitamin-C content. Vitamin C is an antioxidant that fights the free radicals that get unhindered when you’re stressed. It also lessens symptoms and shortens the duration of colds, which may be brought on by stress. Other excellent sources of Vitamin C include kiwi fruit and strawberries. Tip: For a quick burst of vitamin C, simply eat a whole orange. But, avoid bottled orange juice. Salmon. This is one of the best natural sources of Omega 3 fatty acids are reported to be an excellent food to slow down production of hormones adrenaline and cortisol, associated with increased levels of stresses. Also, good amounts of Omega 3 acids in our body can help boost serotonin levels making us feel more happy and content. Research shows that omega-3 fatty acids-overflowing in fish like wild salmon-can help back stress symptoms by boosting serotonin levels, and that an omega-3-rich diet can also help suppress the production of the anxiety hormones cortisol and adrenaline. Tip: Avoid farmed salmon -- instead eat wild salmon. Spinach. Leafy greens may not be your idea of comfort food, but spinach can have a comforting effect. Spinach is packed with magnesium, the mineral that helps regulate cortisol levels and promote feelings of well-being. Tip: Add some spinach in your morning eggs (or smoothie), swap for lettuce in your sandwich, have a salad, steam it as a side dish,or drop a handful of leaves into your soup. Sunflower Seeds: A excellent fund of folate, which helps your body produce a pleasure-inducing brain chemical called dopamine. Low levels of zinc are common among those suffering from stress. It is elemental for boosting the immunelogic and fighting infections. Sushi. Aside from the benefits of fish described on the first page, the seaweed in maki (rolls) also has anxiety-fighting properties. It is packed with stress-relieving magnesium, as well as pantothenic acid and vitamin B2 (riboflavin). Walnuts: They’ve been shown to help lower blood pressure, which is critical for those whose hearts are by now working overtime thanks to high adrenaline levels. In fact, research so strongly backs their health repayment that the U.S. Food and Drug Administration goes so far as to recommend 1-1/2 oz per day (Eat raw, organic walnuts, 1/4 cup daily). A recent study looked at nuts rich in alpha-linolenic acid, like walnuts, and found that they had a heart-protective benefit during times of acute stress -- which are known to cause cardiovascular strain. Breakfast. Almost every other person has a practice of regularly skipping breakfast. Why do we do this? Sometimes we sleep too long and have no time for breakfast before leaving the house. Some people believe that skipping breakfast can help in weight loss, but this idea is absolutely incorrect. Breakfast is the most important meal of the day and skipping breakfast does not lead to anything positive. Skipping breakfast or eating a poor breakfast leads to substantially heightened stress levels and given the role of stress in the deterioration of problem solving and concentration, eating a healthy breakfast has profound implications for everyone, adults and children alike. So, if you're going to eat breakfast, then, eat a properly-balanced meal (such as the Death to Diabetes Super Breakfast protocol) in order to reap the benefits of breakfast and ensure optimum health. Moreover, according to famous British expert nutritionists Professor Tanya Byron and Amanda Ursell, who recently published their Kingsmill Breakfast Report, eating a healthy breakfast can help us to reduce negative effects of our daily stresses. Other Anti-stress Foods. Other foods that help to fight stress include: avocados, chamomile tea, oysters, Swiss chard, turkey. Note: For more details about how to manage stress, read Chapter 13 of the Death to Diabetes book or read the How to Reduce Stress ebook.